Below is intended to advise of individuals and businesses providing servicing and/or sales for bluegrass instruments. My history is several decades of repair and construction work at the renowned McCabe’s Guitar shop in California, then later at my own shop in the Los Angeles area. 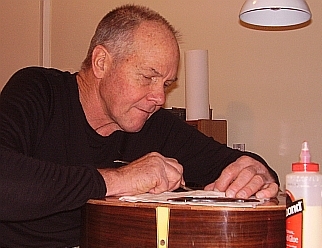 I have a lot of experience with older Martins, Gibsons and Guilds as well as more modern quality acoustic guitars. I provide repair services through my workshop in Feilding. I can take in a small amount of quality work. Note: I do not undertake extensive ‘refinishing’ type of work, due to the toxic nature of the task. Instruments whilst in my shop for repair are stored in a Sentry e-category gun fire safe for security.